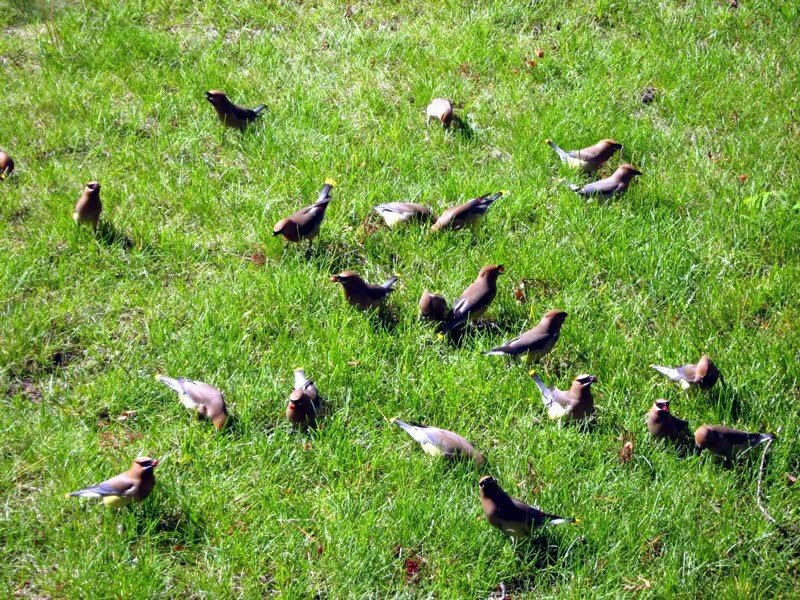 The Cedar Waxwings been partying heartily in my yard for what seems like weeks now. 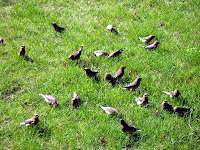 First, they flocked to munch all the dried old berries off my Mountain Ash and decorative plum/cherry trees. Now they're working on the ones they missed on the lawn. The partying goes on as they come in droves -- even in the rain and even late in the evening. I figure they must be making up for lost time. The berries, for the most part, have been on the trees since last summer -- but we had an early frost and snow, scaring the birds off till this spring. Now they entertain me, as I watch their activity and their antics, and I cannot help but smile as they go about their hunt for new nibbles.